IN April 1908, Manavasi Ramaswami Iyer, a supervisor in the PWD at Tiruvannamalai visited the Maharshi at the Virupaksha cave. A friend who accompanied him felt that the visit was a waste. But Ramaswami Iyer desired to have Maharshi's darshan again. 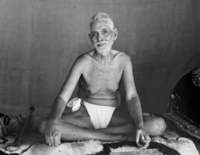 So, he visited the Maharshi again all by himself. The Maharshi was at that moment quite alone. 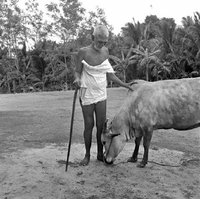 For some unaccounted reason there was an emotional upsurge in Iyer on seeing the Maharshi and he asked him, "Swami, great souls like Jesus arose on the earth to redeem sinners. Is there no hope for me?" The Swami was moved and rising from his seat said in English, "Yes there is hope, there is hope, there is hope." Iyer noted this in his diary, a habit he had cultivated since then. Iyer not only came from a family with a tradition of music, he himself was a composer. On the very day of this visit he composed a song which means: "You are my refuge. I have none else to turn to. You are a sweet and fragrant bouquet of flowers charming to the bees of the devotees swarming at your feet." Subsequently he composed several songs among which the one with the refrain, "In you I take refuge" (Saranagati song) is extremely beautiful and moving. Abhishek Raghuram has taken us to Ramana Sannidhanam in this song. Don't miss to hear the song.